Independent & Group Singapore Tours Packages in 2019/2020 from Travelbag. Watch as the old world seamlessly entwines with the new throughout the wondrous landscape of Singapore, one of Southeast Asia’s most central locations and one filled to the brim with culture, beauty and excitement just waiting to be discovered. The city-state of Singapore serves as the crossroads between the Middle East, Asia and Australia, and although it is surrounded by many iconic giants is not dwarfed in terms of spectacular sights and sounds, hosting a variety of highlights that simply must be seen at least once in a lifetime. Having a deep history of serving as a renowned seaport with a substantial immigrant populous, Singapore has become a cooking pot of traditions and heritages, the residents representing a significant and eclectic mix of Asian cultures all in one place, with Malay, Chinese and Tamil the most prominent, each with their own enclaves and festivals showcasing the greatest aspects of each differing ethos. And as with all locations that house such a mixture of cultures, Singapore is renowned for being a true smorgasbord of culinary delights that true foodie’s simply cannot pass up. From the delicious classics found throughout Chinatown to the tantalising dishes of Little India, Singapore is a place where the discerning diner is sure to find something to appease their palate, with Singapore’s own signature dishes a culmination of sumptuous ethnicity unlike any other. Travelbag have painstakingly put together an assortment of tours to ensure travellers to this wondrous hotspot see and experience Singapore in all its vibrant authenticity, uncovering the must-see and feel elements in the region closer than ever before. The inner city holds many landmarks that all travellers should pay a visit to, with the Singapore Zoo, Underwater World and Night Safari proving to be popular destinations with animal lovers the world over while the Supreme Court, Changi Chapel and Sri Mariamman Temple grant guests the ability to step back in time and take a closer look at the history and religions of Singapore. Shopping, like dining, comes in spades with Singapore; it’s an all-or-nothing endeavour due to there simply being so many outlets to pay a visit to, with the shopping centres of City Hall and Orchard Road tempting many to part with their money. For those looking to cover a lot of ground during their time spent in the Far East, the ever-popular Eastern and Oriental Express comfortably ferries passengers between Singapore and Bangkok and serves as a great way to watch as the beautiful, rural scenery unfolds and shifts before their very eyes as they pass between the two regions. 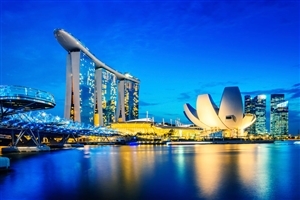 Experience the main sights around the bustling city of Singapore on a four day trip to a city known for being one of the major gateways to Asia and beyond. Alongside the city itself, you’ll also have chance to visit a Malay village to see what life is like in a kampong village. Travel in style from Singapore through the scenic landscapes of Malaysia to Thailand on a three day voyage onboard the Eastern Oriental Express. Enjoy first class cuisine as you travel and stop off to see the sights along the way as part of your memorable railway experience. 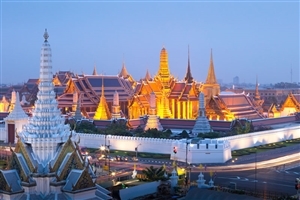 Starting out in Bangkok, you’ll board the Eastern Oriental Express for a scenic and luxurious trip across Thailand and Malaysia to the city of Singapore, stopping off at the famous Bridge over the River Kwai and including a tour of the delights of colonial Georgetown. Make your way between the looming skyscrapers and gleaming lights of Singapore to discover the nuances and distinct characteristics that make this city-state such a renowned destination for vacationers the world over. In a show of age old traditions mixing with modern day fundamentalism, the region presents the very best aspects of the Far East, with many things for people to see, touch and taste on a holiday experience like no other. Venture into each of the ethnic enclaves to get to grips with the intricacies of each prominent group who showcase their own cultures in their food, their festivals and their lifestyles. Whether it’s paying a visit to the historical sites such as Changi Chapel and Sri Mariamman Temple to get a look at the history Singapore has created, exploring the immense shopping districts of City Hall and Orchard Road on a spending spree or simply easing back and taking in the soothing ambiance of the oasis that is Sentosa, there is something for everyone to be found in the magnificent land of Singapore. Sample the culinary delights of several cultures from each enclave. Pay a visit to the heavenly island resort of Sentosa. Meet and greet the local wildlife at the Singapore Zoo and Night Safari. Discover the charming villages that lie just beyond the city. Take a time out to discover the beauty of the National Orchid Garden. For more information about Travelbag’s excellent range of Singapore tours, call 0203 944 2201 to chat with one of our knowledgeable travel experts about creating the perfect Singapore holiday for you. Dinner is served – Any visit to Singapore should be geared towards sampling the variety of flavours the city has to offer, with Malaysian, Chinese, Indian and of course Singapore dishes to be found amongst the enclaves. Bump in the night – You don’t have to be an animal lover to get the most out of paying a visit to the Singapore Zoo, but once you experience the world’s first nocturnal zoo; Night Safari, we can certainly count you amongst the animal aficionados. ‘Till you drop – Get ready to burn a hole in your wallets and purses with the magnificent shopping outlets and centres peppered throughout City Hall and Orchard Road. A real shopper’s paradise, don’t say we didn’t warn you. The Age of Wonder – Uncovering the city’s enriched history is almost like a separate trip all unto itself, with such traditional landmarks as Changi Chapel and Sri Mariamman Temple serving as looking glasses into a time long ago. Vantage point – Catch some of the most spectacular glimpses from Singapore’s Tiger Sky Tower, the highest observation tower in the region that overlooks Singapore’s unforgettable skyline and on clear days, Indonesia’s skyline too. Time to celebrate – Playing host to so many cultures, Singapore is never in shortage of a good festival, with at least one from each ethnic group a year causing fireworks and lanterns to light up the night sky. All aboard – For those looking to venture out of Singapore, there’s no better way to travel than the renowned Eastern and Oriental Express to Bangkok for seeing the shift in landscapes between one region and another. Golden afternoon – What better way to showcase the undeterred beauty of Singapore than with a walk around the National Orchid Garden, or for a more unique twist, be sure to check out the stunning Cloud Forest, it’s man-made but we doubt you’ll hold that against it. Frankie say relax – The fast paced lifestyle of Singapore has made sure business for some of the best ways to unwind, and with the myriad of health spas to choose from that you simply must experience, you can expect to be soothed to the core in no time. A different pace – With so much to see, it would be easy to stay within the city limits of Singapore, but to complete the authentic experience we highly recommend stepping outside to see some of the charming villages that make up the surrounding area.